1985 was an eventful year for pop culture. Seemingly every major American singer came together to sing "We Are the World." Marty McFly took his first drive in the DeLorean. CDs were introduced to the North American market. Microsoft Windows 1.0 debuted. Transformers dominated one half of toy stores while Cabbage Patch Kids were big on the other. In the hobby, Mark McGwire and Mario Lemieux got rookie cards. And so did Adam Bomb and a host of other gross-out guys and gals. Three decades later, CDs are a fading relic and Cabbage Patch Kids are still around but just barely. 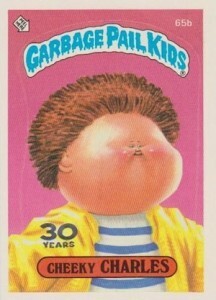 2015 Topps Garbage Pail Kids 30th Anniversary looks back on GPK history while offering lots of new content. Like recent Garbage Pail Kids sets, there are two different hobby configurations, a basic one as well as Hobby Collector, which focuses more on inserts and chase content. The base set is a big 220 cards -- 110 cards, each with the trademark A and B variations. It's not like the dozens of GPK sets that came before it. Rather, it builds off of the brand's past as well as pop culture from the past 30 years. There are a total of 11 subsets in the 2015 Garbage Pail Kids 30th Anniversary base set. Cutting Room Floor features characters and gags from Tom Bunk created during the brand's original run that weren't used. Similar are Lost Alternate Art cards. These use early versions of existing characters. Artistic Interpretations lets other artists play in the GPK sandbox to create new looks. Artistic Influence has GPK spins on classic works. 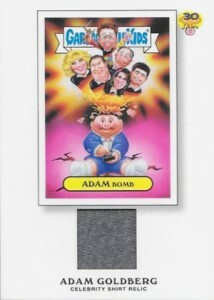 Adam Bomb's Don't Push My Button uses other characters for the signature gag. Covers from the recent IDW comics are recreated on cards. Other subsets include '80s Spoof, Garbage Pail Kids' Kids, Garbage Pail Pets, Garbage Pail Presidents, and Zoom Out. Ten different C Variations are inserted 1:100 packs. 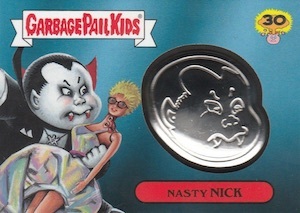 2015 Topps Garbage Pail Kids 30th Anniversary has lots of parallels. Black are the most common, landing 1:2 hobby packs and one per hobby collector pack. Silver fall one per hobby box while there are 85 copies of each Gold parallel. Exclusive to hobby collector packs are Metallic Red (1:1), Character Back (1:1), Pink (1:24), and Sepia (1:24). Base cards also have four different Printing Plates, each of which is one-of-a-kind. Foreign Legion Stickers (1:24) offer a glimpse at what Garbage Pail Kids look like around the world. Even with the massive base set, there are a handful of additional inserts. 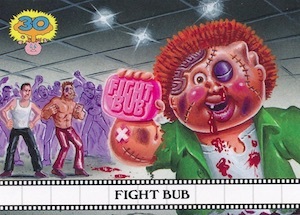 Famous Movie Scenes (1:4) recreates familiar moments with GPK characters. Horror Films (1:8) spoof classic posters. Super Fan Tattoos (1:4) are stickers that parody body art. 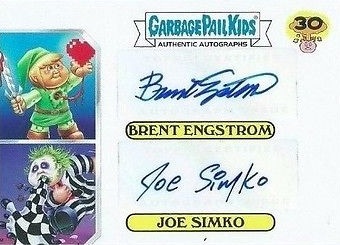 Familiar premium inserts include sketch cards, autographs and die-cut sketch cards. Dual and Triple Autographs are only in hobby collector packs. These feature signatures from multiple artists. Autographed Pen Relics come with a piece of the autograph signing pen embedded in them. Artist Relics have swatches of shirts worn while creators worked on their cards. 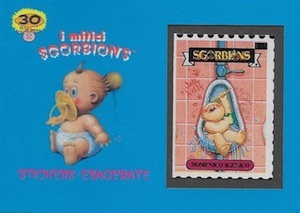 Other hobby collector-exclusive chase sets include Medallion Cards, which have one of six different classic GPK characters, and Stamp Relics that have original Italian GPK stamps. Each hobby collector box also has a Barf Bag. Buybacks are inserted one per hobby box. 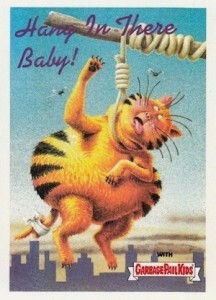 These are original Garbage Pail Kids cards from the past. 220 cards. Shop for sets on eBay. 1 The Guest Who Wouldn't Go Home! 3 The Blob That Ate All Your Food! 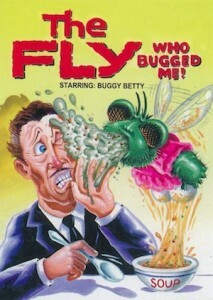 5 The Fly Who Bugged Me! 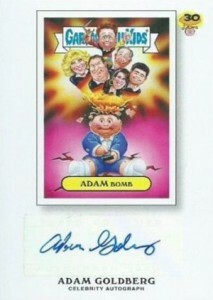 3 Garbage Pail Kids Rule! 5 Have a Nice Day. 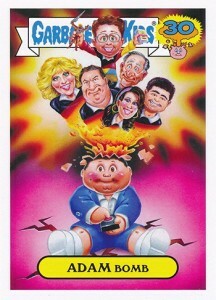 6 Hooked On Garbage Pail Kids! 8 Take a Garbage Pail Kid to Lunch. 9 Visit Garbage Pail National Park. 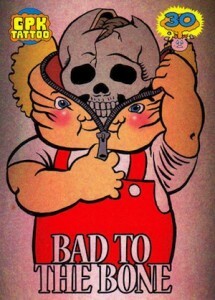 11 How to Be a Garbage Pail Kid. 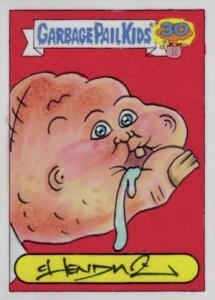 12 It Takes Guts to be a Garbage Pail Kid. 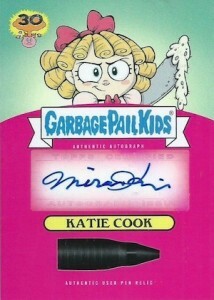 13 Miss Garbage Pail Kid. 2 Hang in There, Baby! 10 cards. 1 per hobby box. I cannot wait for these cards to release, tons of cards to collect in this set. I have a gold parrel for tounge kiss Trish 30th anniversary. Anyone know how much its worth or how to find a website talking about it?